Allison Rivers Samson: The focus of your recipes is on “bringing food home to main street.” Could you explain to readers what that means, and why you think it’s important? John Schlimm: I was born and raised, and once more live, in a small town called St. Marys, which is nestled in the mountains of Western Pennsylvania. I never heard words like vegetarian, vegan, or factory farm growing up. Now that I am writing vegan cookbooks, it’s important for me to make sure that my recipes are small town friendly, meaning my friends and neighbors in St. Marys and small towns everywhere can go to local supermarkets (and occasionally the liquor store ~ wink, wink!) and find all the ingredients they need, just like our big city pals can. Likewise, so often vegan recipes will use ingredients that are hard to even pronounce let alone find anywhere short of some obscure health food store on Mars. That will never be the case on my watch. I like to think of my vegan cookbooks as Parties-in-a-Book to which everyone is invited, even our more carnivorous pals. That means the recipes and feel of the books need to be easy and accessible for anyone, anywhere to enjoy. For the few new ingredients that I may introduce, particularly to my small town audiences, such as vegan sour cream, cream cheese, nutritional yeast, chocolate, etc., I have extensive pantry sections in my cookbooks that provide either homemade, plant-based recipes for these items or door-to-door online links for ordering them. By bringing vegan cooking, eating, and partying home to Main Street, I’m trying to spread compassion and fun one bite at a time! ARS: This past fall, you released two new books: The Cheesy Vegan and Stand Up: 75 Young Activists Who Rock the World, And How You Can, Too! Tell us a little about those books. JS: It was such an exciting fall for me! In their own ways, both of these books broke new ground. Since writing my first vegan cookbook, The Tipsy Vegan, and then Grilling Vegan Style, I have sought to smash through the ridiculous and silly stereotypes that we vegans are strange and boring and that we eat weird, mysterious food. What I can guarantee is, again, that will never be the case with my cookbooks or me. (After all, I end most parties by dancing on top of a table! “Boring” has been eliminated from my vocabulary. HA!) After reclaiming the bar and grill for vegans everywhere, I then set my sights on the one item that keeps so many people from fully transitioning to a plant-based lifestyle: cheese. With The Cheesy Vegan, I have brought plant-based cheese home to Main Street as well for everyone to enjoy. I have been particularly excited to hear how kids are having fun making these cheesy recipes because they are so easy. In fact, I can summarize the nearly two-dozen homemade vegan cheese recipes in the book in four words: mix, blend, set, eat! 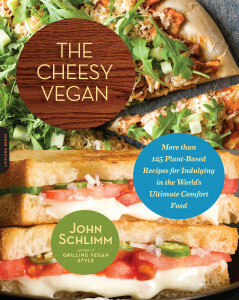 The Cheesy Vegan also includes over 100 recipes that those cheeses can then be used to make—everything from breakfast and brunch, soups and salads, sides, sandwiches, snacks, and suppers to entire chapters dedicated just to mac ‘n’ cheese and cheesecake. Another great thrill this fall happened at the end of my national book tour for The Cheesy Vegan, which had started with me emceeing DC VegFest in October. In November, I was invited to deliver my keynote address titled “Embrace Compassion, Change the World” on Capitol Hill at the Congressional Vegetarian Staff Association luncheon. Among other things, I told the audience: "By being part of this amazing Veggie Caucus, each of you is showing the world that COMPASSION is not limited to a political party or ideology, and that even in the most powerful place on the planet, COMPASSION is a priority, and it matters." A few weeks before The Cheesy Vegan was published, I released my other new book, Stand Up! : 75 Young Activists Who Rock the World, And How You Can, Too! I am over the moon about this book. It is a generation-defining look at young people today and the growing movement they are leading towards compassionate service in all areas, from environmental, poverty, politics, and health to education, military, special needs, equality, and so much more. Stand Up! contains stories written by 75 young activists, some of whom started their efforts as early as two and three years old and many have founded their own successful nonprofit organizations and grassroots missions. While I wrote this book for a young adult audience, anyone of any age will be inspired by the work being done by these young leaders, who are embracing and ROCKING this world with all they’ve got. I also wrote the companion Stand Up! Discussion Guide as a free download for teachers, parents, students, community leaders, and anyone else who works with young people to further help them engage and inspire. ARS: Wow, that's an impressive collection of accomplishments! What aspect of your career are you most proud of? JS: I’ve been very fortunate to have a career that has spanned several fields, from the political realm in Washington, D.C., working as a celebrity publicist in Nashville, and serving as a professor at a university here in Pennsylvania to traveling the country delivering speeches, writing fifteen books, and recently joining the Board of Directors at Straub Brewery, which was founded by my great-great-grandfather Peter Straub in the 1870s. But amidst all of that, I am most proud and most humbled that I am able to help spread compassion in this world through the work I do, particularly as an activist, author, artist, and educator. I believe we all have a duty to give back to our fellow living beings and the planet. 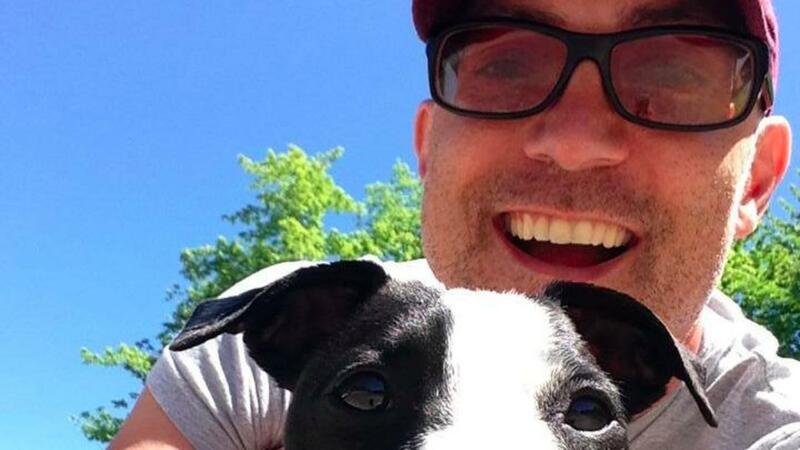 While being a public figure certainly has its perks and is nice, I realize my true purpose and calling when I am doing things like talking to audiences about embracing compassion and especially when I’m at our local animal shelter, anonymously walking the rescue dogs who are there—out on that road, we are just a boy and his dog. Those precious animals don’t care how many books I’ve written or where I’ve been, but when I’m hugging them and looking into their beautiful eyes, that’s the true magic of this life—those are the types of connections that count the most for me. ARS: I couldn't agree more. You’ve also indicated that another book is in the works... Any hints on what it’ll feature? JS: I’m returning to my boozy-FUN roots. My next cookbook will be The Ultimate Beer Lover’s Happy Hour: Over 325 Recipes for Your Favorite Bar Snacks & Beer Cocktails. The cookbook will contain delicious food recipes and suggested pairings with today’s most popular seasonal and craft beer styles, as well as one of the largest collections of cocktails and other drinks made using beer as an ingredient. The Ultimate Beer Lover’s Happy Hour will be out in August, but it is available for pre-order now. All I can say is: GET READY TO PARTY (and dance on a tabletop) WITH ME, AGAIN!!! John, thank you for taking the time to talk with us, and for spreading the fun word about compassion!